Sitting outside of the Letterman Digital Arts Center in San Francisco’s beloved Presidio is a statue of one of the wisest beings in the galaxy far, far away, and you can receive his blessing for nothing more than some pocket change. Jedi Master Yoda, known to generations new and old as maybe the wisest Jedi in the Star Wars universe has been immortalized in bronze atop a decorative fountain outside the headquarters of Lucasfilm, and he attracts droves of new acolytes each day. Unlike its subject who claimed to be over 900 years old, the fountain-topping bronze was only installed in 2005, much to the delight of the hoards of fans who now make the mile or so trek away from the Presidio’s more well known attractions to supplicate at the feet of the master. At only just over two feet tall, the statue is essentially life-size, and is sculpted to look like the aged version of the wise little gremlin as he appeared in the original Star Wars trilogy, as opposed to the smoother young Jedi CGI’d into the prequel trilogy. Visitors often follow the fountain ritual of throwing in coins to wish for good luck, although in this instance they are more likely to receive a blessing from the Force. 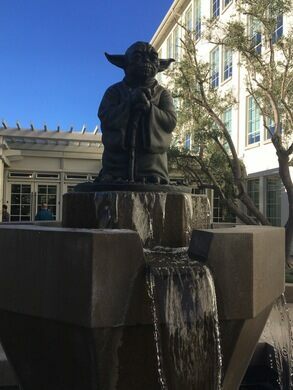 The fountain is located just off of Letterman Drive in front of the Letterman center’s Building B, which contains the the Lucasfilm lobby. The lobby can also be explored during weekday hours, and features even more Star Wars memorabilia including a life-size Darth Vader and a selection of books that inspired George Lucas’ most famous creations. However those wishing to avoid weird eye-contact with any Lucasfilm receptionists may want to choose wisely and settle with making a wish on Yoda’s feet. May the Force be with you. The largest Star Wars collection in the world is its own galaxy of collectibles.